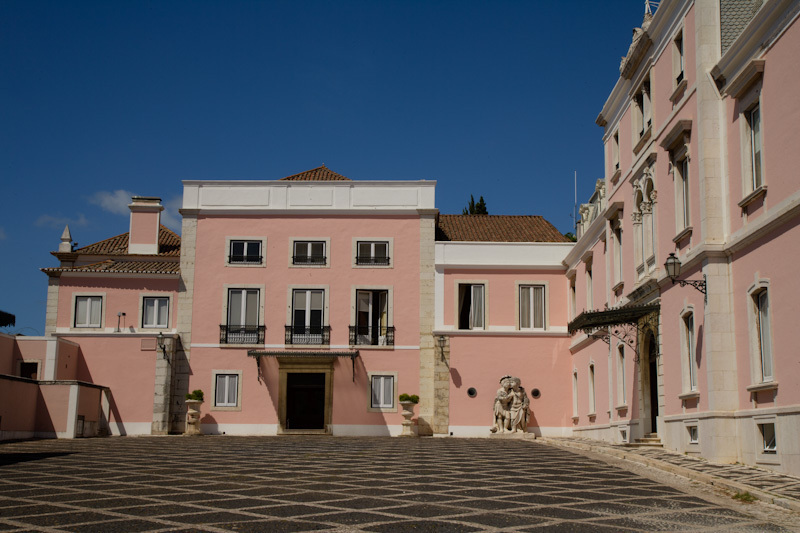 The Palace, located in Belém, formerly a royal palace, is now national monument and the headquarters of the Presidency of the Portuguese Republic. Known as the “lions’ den” in the 18th century, it appears to have as its emblem a lion – a manor house symbol that allies Wisdom with Power. 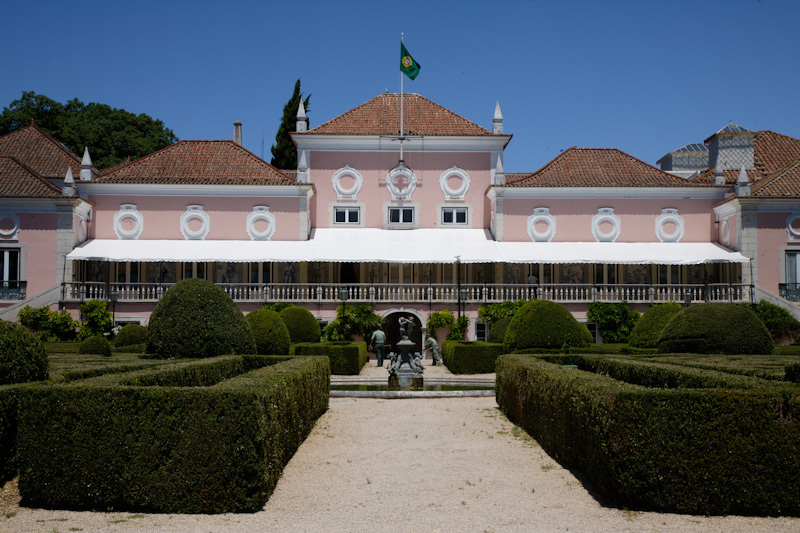 A green flag with the national arms is hoisted at the palace when the President is present at Belém. A central architectural group of five buildings facing the river Tagus stands out from the surrounding buildings and landscape. 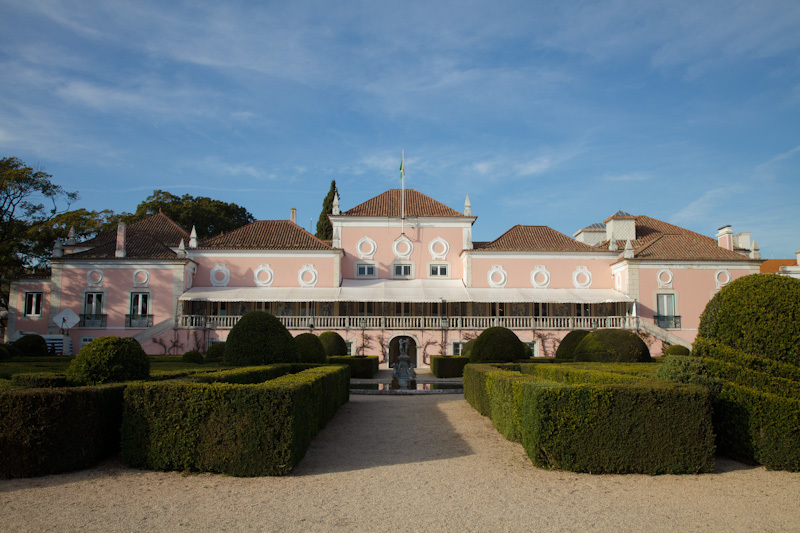 A manor house to the east of the Patio das Damas (the Ladies’ Patio) – the Annexe – is followed, at the corner to Calçada da Ajuda, by another building – the Royal riding school, now the Coach Museum. To the west lie the Patio dos Bichos (the Animals’ Patio), the Arrábida Pavilion and the Cascata Gardens. 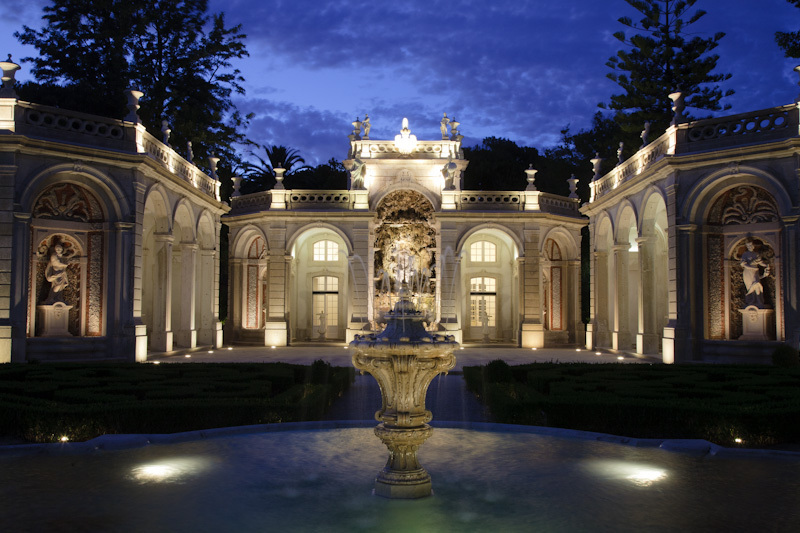 To the south lies the Great Garden which ends in a mirador the railings of which stretch east and west to end at two small pavilions formerly known as “recreation houses”. 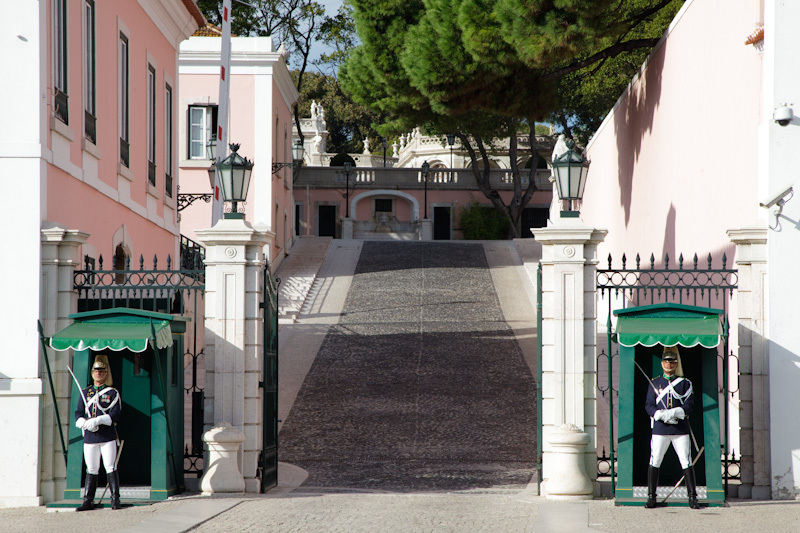 The entrance to the palace is by way of the Patio dos Bichos and it is through this that the President of the Republic’s guests and official visitors enter. 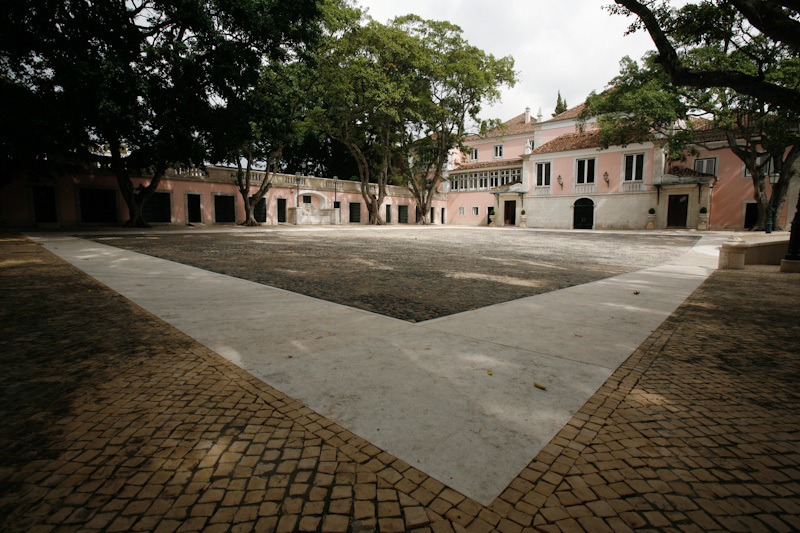 On the left as you go up is the old Patio das Equipagens where the stables were and coaches and harnesses were kept. 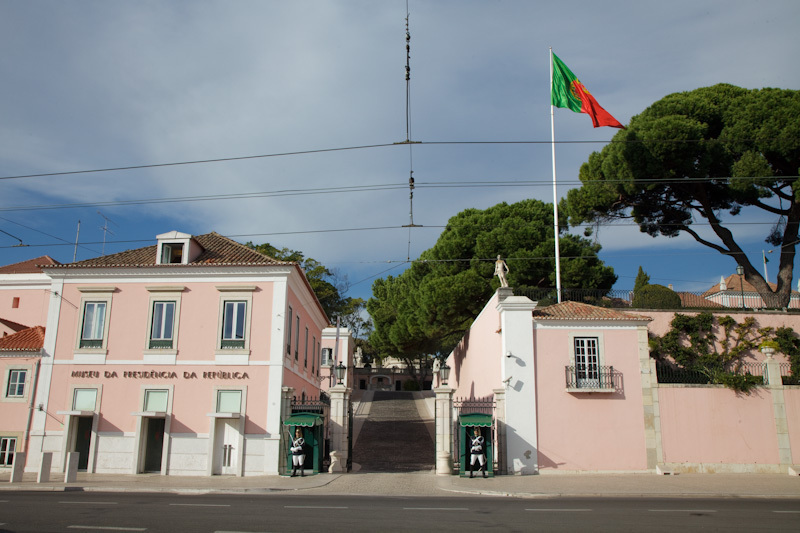 The Museum of the Presidency of the Republic is now located here. The ramp ends at the Patio dos Bichos. 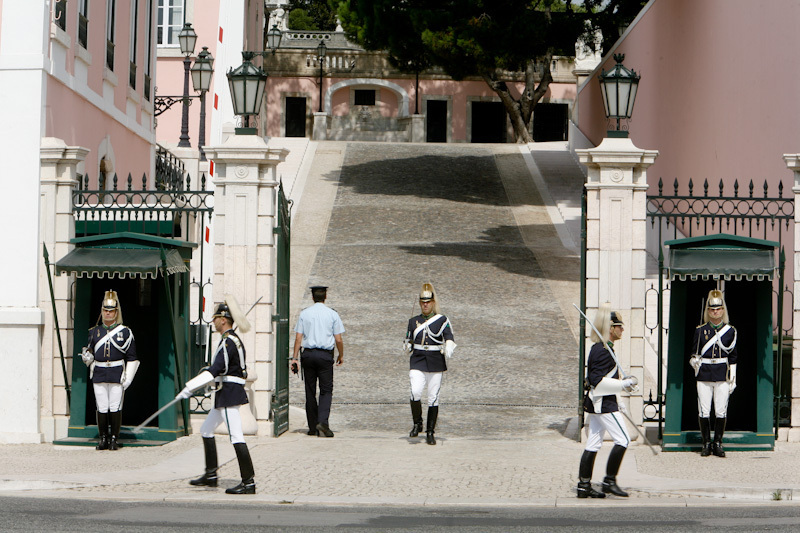 It is next to this entrance that the Changing of the Guard is held at eleven o’clock on the third Sunday of each month, performed by the Belém National Palace guard of honour. 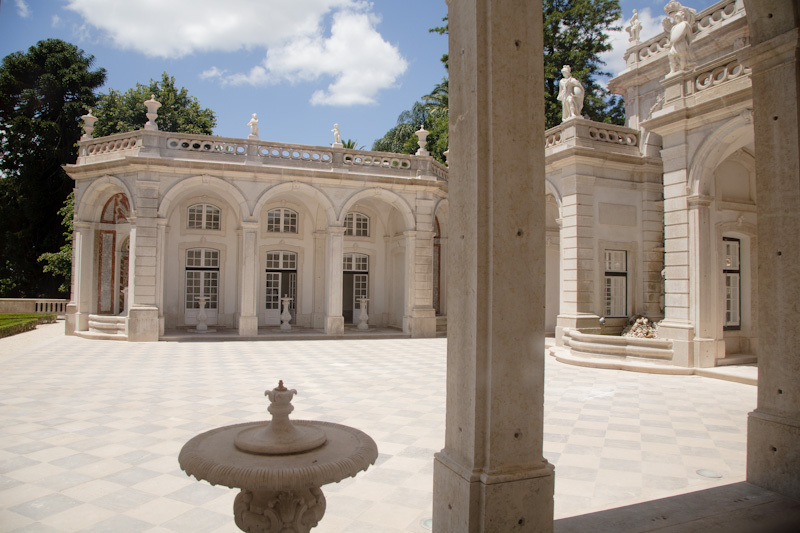 On entering the Patio dos Bichos you see, on the right, the western façade of the palace. 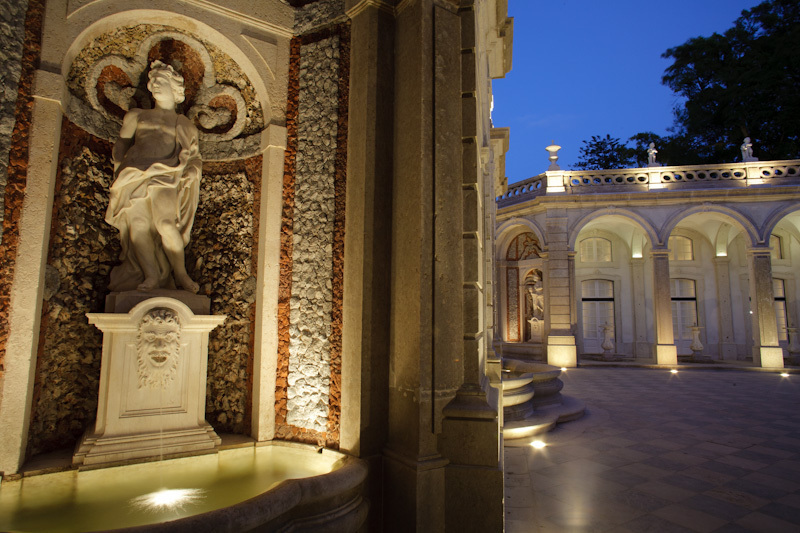 Here, the diversity of the construction marks the junction of the two buildings; the Arrábida Pavilion and the palace. The façade has a central doorway and two side doors, besides three french windows. At the end of the patio there is a wall with a fountain and several barred doorways to areas that, at one time, housed wild animals from Africa. Going up the stairway leading to the Sala das Bicas you can see the stone portico (formerly outdoors) and the stained glass windows that were introduced at a later date. 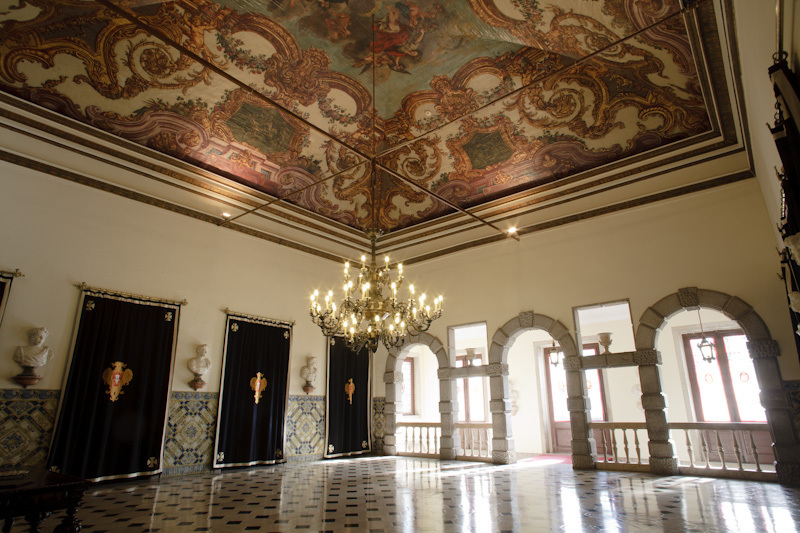 The Sala das Bicas has a black and white marble tile floor, polychromatic tile wainscoting and jasper busts of Roman emperors, an enormous bronze chandelier, dark arrases bearing the arms (without crown) of king João V, a painted wooden ceiling and two ‘bicas’ (or spouts) that give the room its name. 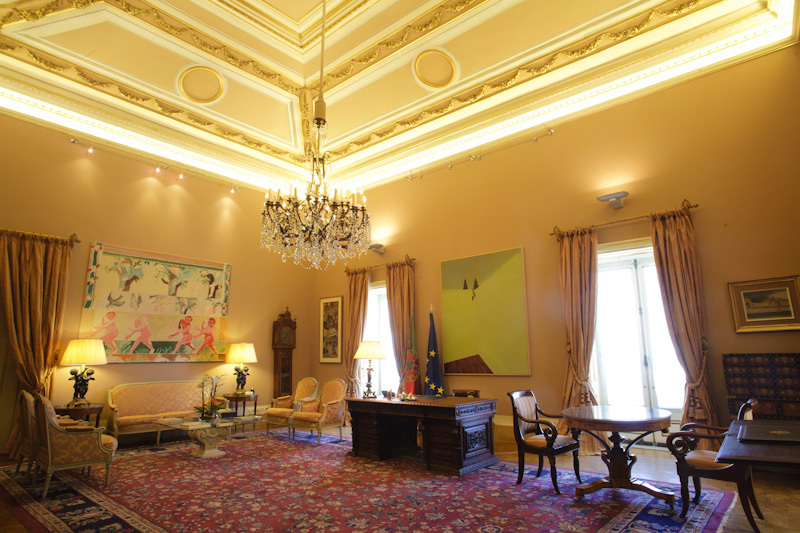 Pictures of this room are often shown on television when the President of the Republic’s visitors are interviewed. To the right of the Sala das Bicas is the Dining Hall in a part of the building that was added later to the original building put up in the 16th century by king Manuel of Portugal. 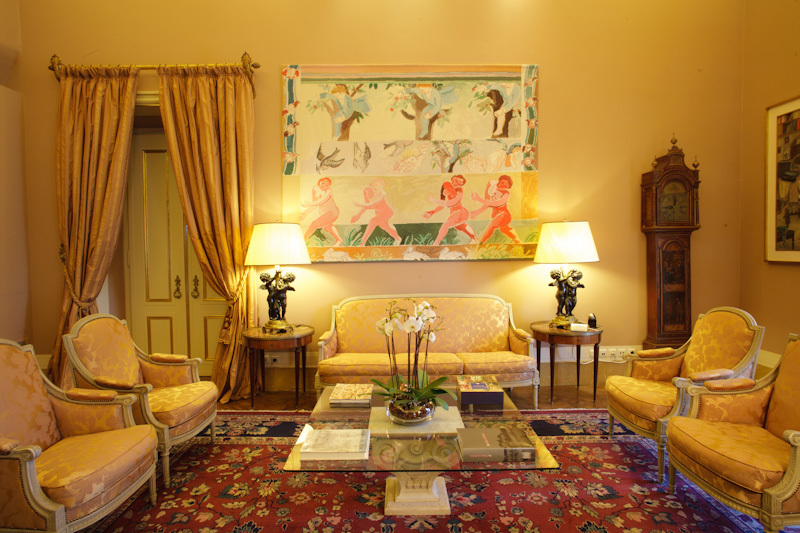 There was a time (1980-85) when this hall was used as a museum to display presents offered to President of the Republic Ramalho Eanes. 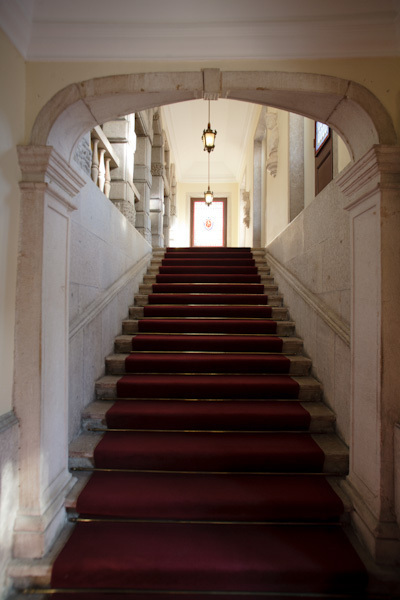 Following this, it once again came to be used as the dining room when entertaining foreign guests visiting Lisbon. To the left of the Sala das Bicas is the Portrait Gallery (of former presidents) which, in 1985, was prepared to receive the portraits of the presidents. The oil-on-canvas portraits of every president to date are on display here. 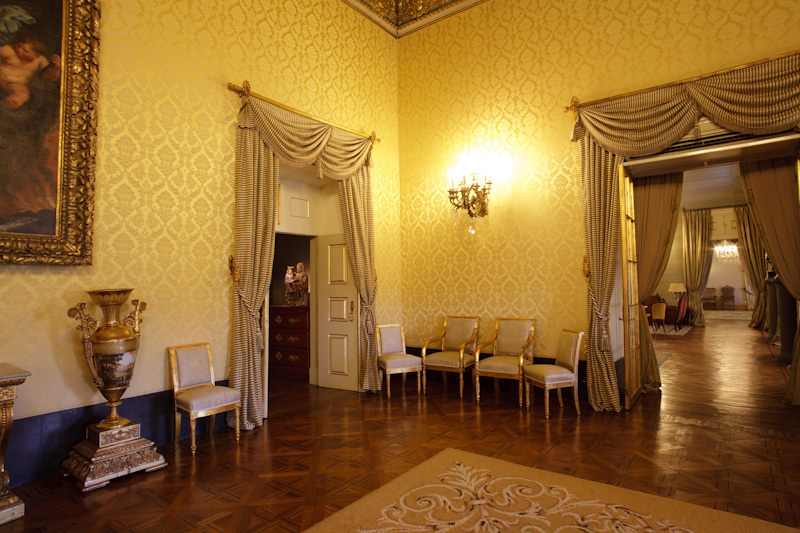 The Sala Dourada (Golden Room) communicates with the first of the three reception rooms of the palace – exactly as it was conceived in the times of king Manuel. 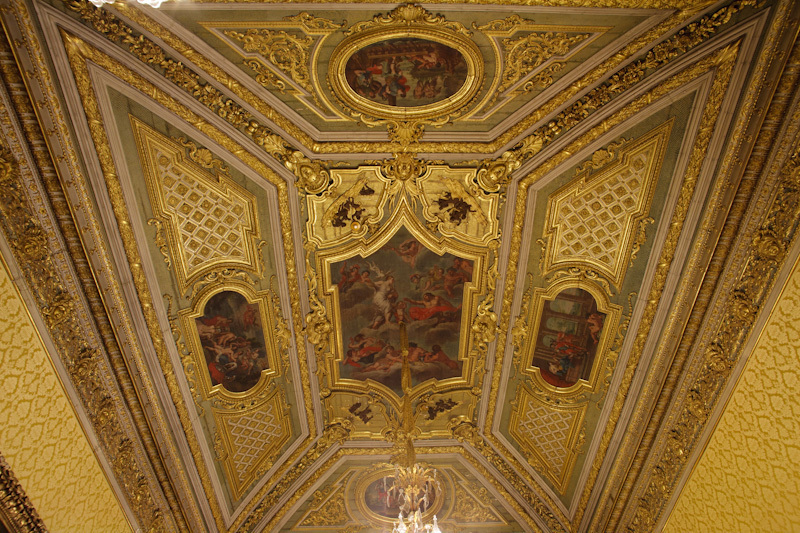 The sumptuous ceiling of the Sala Dourada was erected in the 18th century. It is made in panels, has a central allegorical painting and four medallions surrounded by a profusion of gilt ornaments or carved wood. 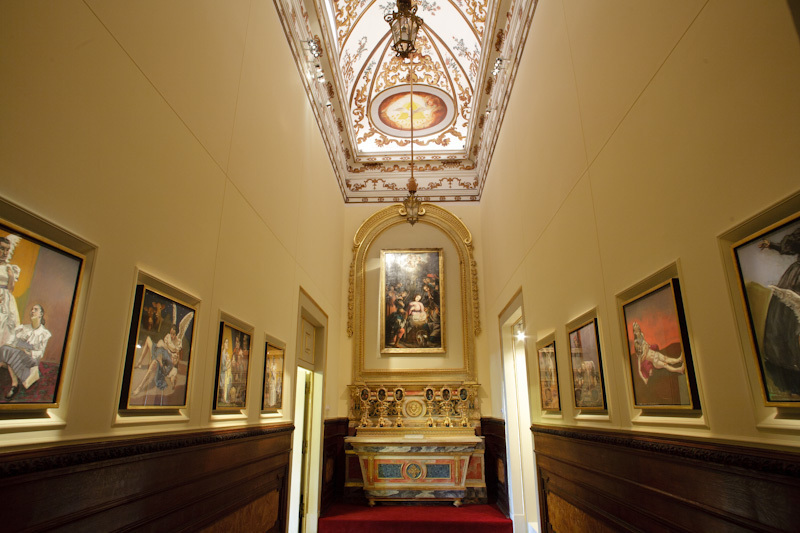 Behind the Sala Dourada there is a small chapel where king Manuel II and his brother, Luís Filipe, were baptised, as was Miguel, the second son of President Ramalho Eanes. 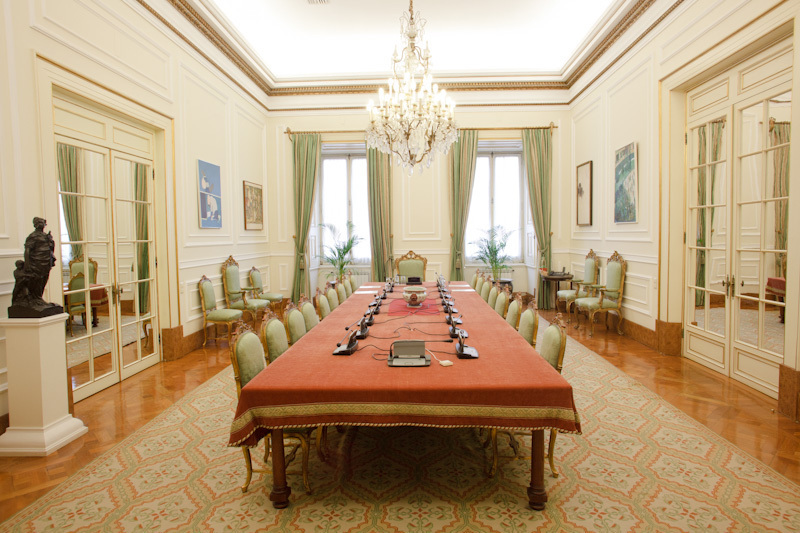 The Sala Império (Empire Room) – so known for its Empire-style furniture – also known as the Sala Verde (Green Room), was called the Portraits or Presidents Hall because the portraits of the Presidents of the Republic hung there up to 1985, and, before that, as the Sala D. João V (king João V Room), because, at one time, there was a magnificent bust of the king there, a bust that is now at Mafra Convent. 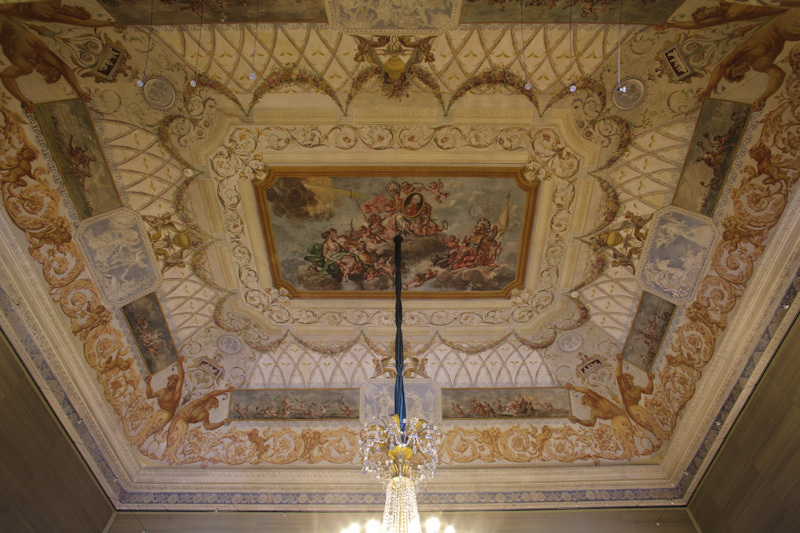 On the wall where the portraits used to hang there is now a large painting that contains an element curiously similar to the one at the centre of the painted ceiling: a medallion of king João VI. 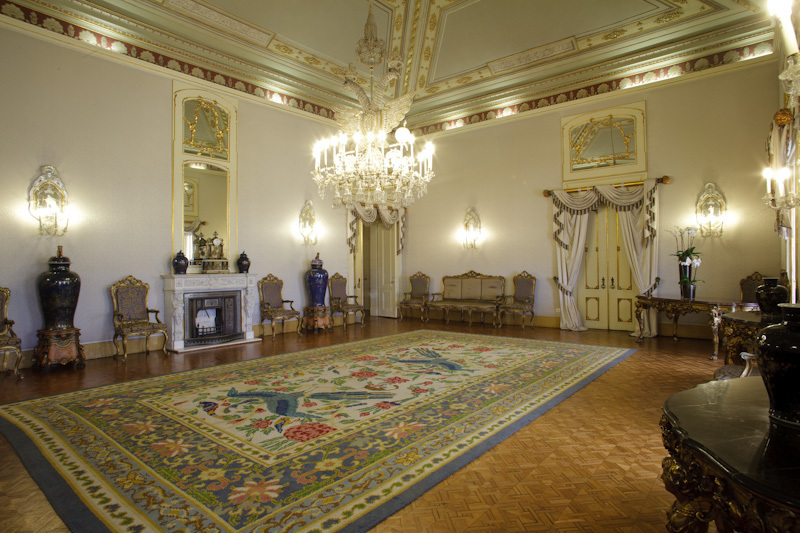 This is followed by the Sala Azul (Blue Room), also known as the Sala dos Embaixadores (Ambassadors Room). 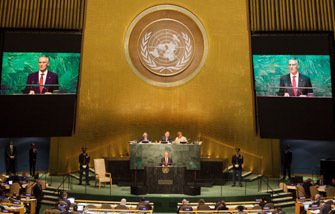 Individual members of the government are now sworn in here and it is here that foreign ambassadors deliver their credentials to the President of the Republic. 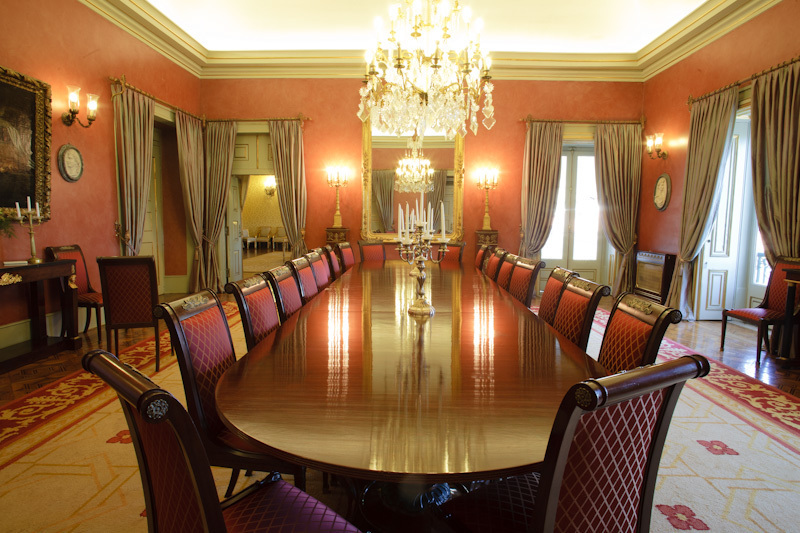 The President’s Office communicates with the Sala Azul. During many years it was a bedroom and several kings and illustrious guests of the Crown slept here. This room has undergone various transformations. 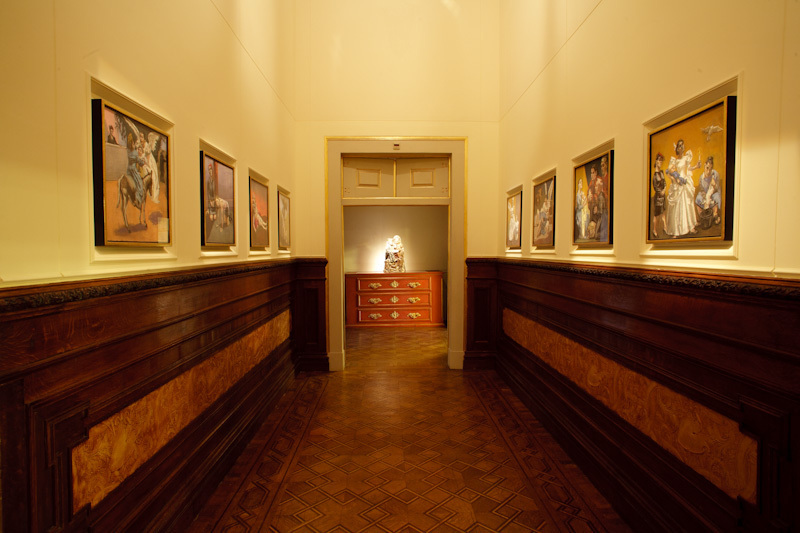 The more recent include the work carried out to create accommodation for queen Amélia in 1886, in which artists Columbano and Malhoa were involved. 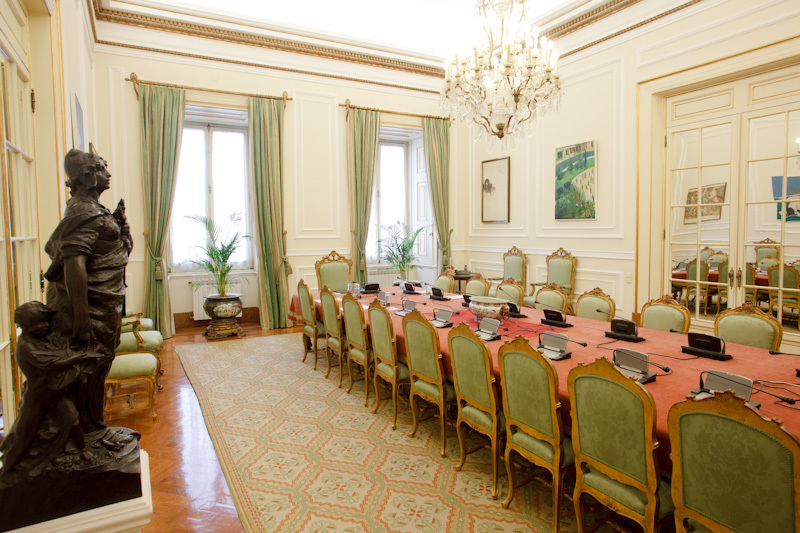 The President’s Office had previously been elsewhere, and at that time this room was used for the meetings of the Council of State. 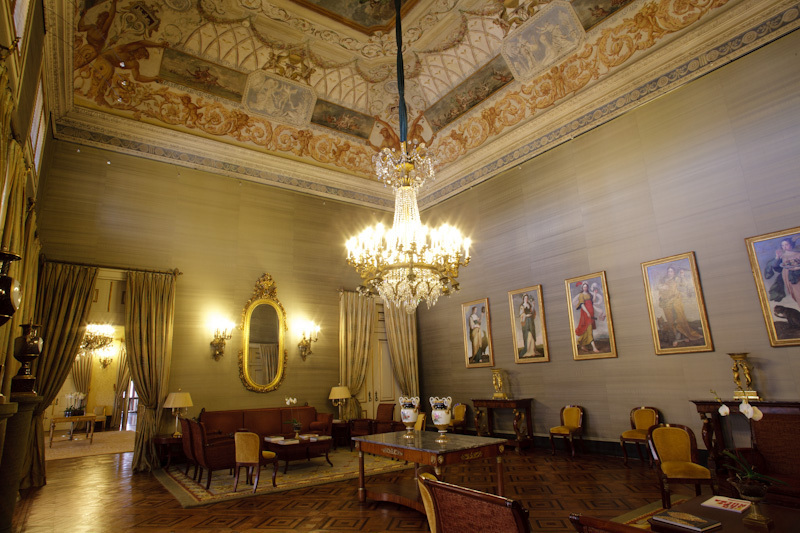 The room where the Council of State now meets is the one where, in 1852, queen Maria II adapted the ballroom and where, at the time, several intimate court balls were held. 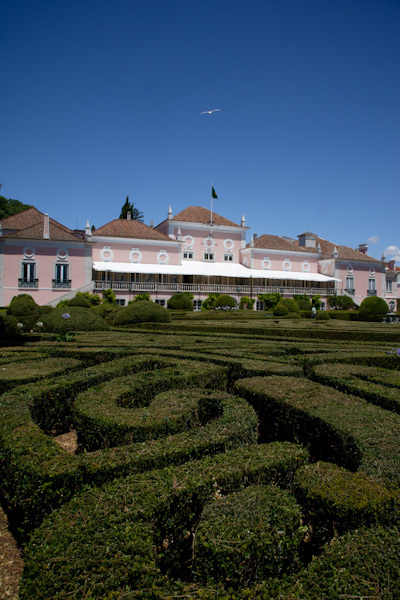 The general traffic of the palace involves passing through the Patio das Damas. Here, little remains of the times of king Manuel, when it was far smaller. 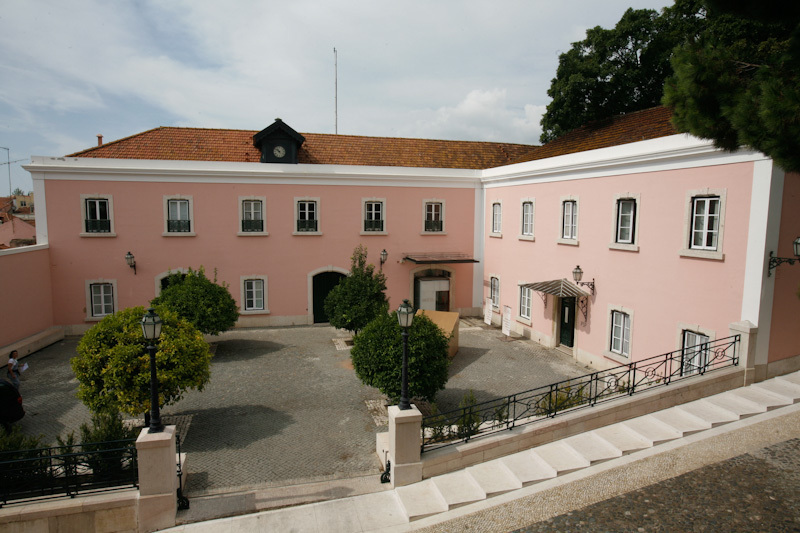 Nowadays the patio is bounded to the left of those entering by the rear of the Coach Museum (the old riding school), at the far end by the wall of the Box Garden and by the eastern wing of the palace and, on the right, by the manor house built early in the 20th century by king Carlos to accommodate official visitors. It was then that he knocked down the old buildings, enlarged the patio and opened the gate to Calçada da Ajuda.